restnrileks : ): Wordle, Cd doodle and Doodley2x! doo..
Wordle, Cd doodle and Doodley2x! doo.. I am going to start this post with..
People write songs about singing in the rain, but in real life, when they get wet, they moan. People love to watch Indiana Jones wading kneed deep through snakes and spiders, but when their office air-conditioning fails, they explode. Perhaps, if we had less adventure on our video recorder, we would look for more adventure. "Being Comfortable" is overrated. I am not talking about "money" comfortable but "situation" comfortable. Much of our stress is created by our addiction to comfort... "Planes should always be punctual, the workload should always be easy, the bank overdraft should be comfortable.." Too much comfort gets boring. Our brain seizes up. The less rules you make for how life ought to be, the easier it is for you to respond to whatever happens. Something else about comfort. You will notice that, very often, courage is better rewarded than IQ - and this frustrates some people. Fred says " I am highly intelligent, I ve got two degrees - and i cant believe people get better jobs and make more money!" As a rule, rewards come when we risk our reputation or our money - or both. Well, i am sure you ve heard doodle - Now, i presents you Wordle (found it thru doodleage). Yup! that is right, a combo of "word + doodle". 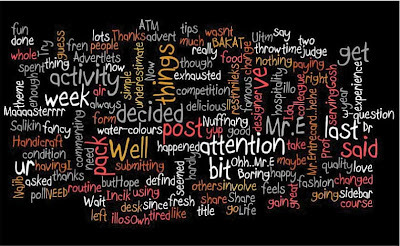 "Wordle is a toy for generating “word clouds” from text that you provide. The clouds give greater prominence to words that appear more frequently in the source text." You should give this a try. I ve come up with mine after key-in restnrileks.blogspot.com - or, you can simply type in certain words. The java applet will then work it out for you (kinda like the one that make you a flower tree based on your site). You can customize it to your liking too. Check its gallery. Whoaho! i like mine after teaking it a bit here and there. Have fun!! 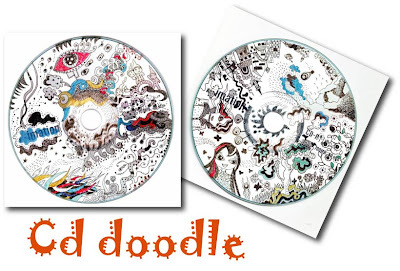 Doodlage is having a contest of doodling on CD. Doodlage, true to its name, is about "On a quest to elevate doodling to the status of an art form that it deserves! Notebook pages, sticky notes, scraps of paper… These treasures end up in garbage and vanish from the face of the Earth forever. Trashcan art salvage. Enjoy." Doodlage houses many great artists of different styles. Wow! What else can i say - superb. The contest idea seems fun. So, err restnrileks pun join la. Closing date will be on 12th August. I just did mine yesterday. I did my doodle on two blank Cds.. Only on the front part since my pen-ink wouldnt stick to those shiny glossy back surfaces. Added some colours using markers on some spots here and there. Well, they have this group on Flickr where you can upload your work. See here - Flickr : CDoodling Group. Restnrileks says tata for now. haha. great.. cepatnya komen.. nii internet dah okay ka? Shells and rocks? i know, i ve seem many artists out there using other than just paper as their medium of expression. Just imagine!, arts on rocks? Cooooll!! a great way to bond with your child too (kalau buat sebagai aktiviti yang pupuk minat kanak2 laa kan..) and a good way too to sell as paper weight too. hehe. Hehe, i think i like the Wordle more that the "flower-style." Coz we can tweak the colours, fonts, styles and etc, so, jadi lebih our stail arrr kan.
Jangan lupa post kat blog, nanti boleh tgk camner keluar nanti. huhu. Ohh!! This is really nice award Rizal! Lama dah tak masuk online kan. haha. I just updated my website just today. :) How's your day Rizal? Good? OMG!! i'm really amazed with ur doodle on cds. i can never do that!! be proud of ur style rizal!! will check doodlage soon!! As usual fantastic work. Thanks ever so much for hanging in there ith me while I have been going through some difficult times. Just dropping in when I haven't been able to drop back has truly helped me through a tough time. wah dah update yer.. tak per, i think you are quite busy jugak akhir-akhir ini. ayat itu begitu bermakna. huhu. Wah makin sibuk menyiapkan segala tempahan yer.. :).. Thank you for that thoughtful award. I hope things are going to be okay over there. My blog rocks?!! Ackk!! blush blush..
Doodage is amazing! Now I am going to collect rocks and broken vases so that I could doodle on them! Ya lah Pak Rizal, I'm thinking untuk bahagi-bahagikan aja EC points tu...to those yang bagi komen..ok tak my cadangan. They are far better than mine. that is a great idea.. boleh tambah koleksi.. btw your ATCs have arrived. they look great..
Wah pak bono, tuu kira cadangan yang okay tuu..
kira bagus jugak.. sebab "nawaitu" memang nak bagi 1000c kan? hehehehe..
pak rizal ..betul tu ..nawaitu nya udah ada..
i am restnrileksing sampai termalas2 nak update blog.. hehehe..